The Infratek model 31 handheld, battery operated, single and three phase power analyzers are valuable engineering tools designed to offer precision measurement on all types of signals including electronic drives. The Infratek Model 31 hand-held Power Analyzers are sophisticated measuring instruments, single phase and three phase, designed for laboratory and field use. 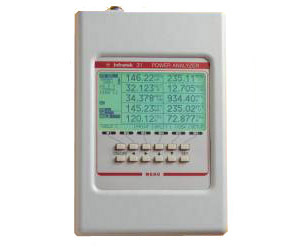 Unlike other instruments in this price range the Model 31 Power Analyzers are suitable for measurements on frequency inverter drives, light ballasts, and other electronically controlled loads. The wide frequency range, the high common mode rejection, and the fact that you can measure currents of up to 50A directly without having to use clamps guarantees excellent accuracy for all types of measurements. The Infratek 31 Power Analyzers are controlled by six menu soft keys M1 through M6, five cursor soft keys, and one power-on/off soft key. The operating procedure, to configure the display, to configure the interface, to set scaling factors, and to select the input, the ranges, and many more functions, are self-explanatory. You can store your personal instrument configuration in nonvolatile memory and have the unit start-up with your personal configuration at power-on. Efficient data processing makes simultaneous measurements in a three phase system possible. Three rms line voltages, rms line-to-line voltages, rms currents, power, power factor, minimum, maximum, harmonics of 3 currents and 3 voltages, and all derived quantities are determined from the same measurement interval (minimum 250ms). You have the choice to display phase values including wave forms or bar graphs, or you can display total and average values in the 3 phase system. You can also display the values of all three phases including their sums and averages. The Model 31 Power Analyzer includes a data logging mode to transfer data from a dynamic process to a personal computer for further analysis. Also, current harmonics according to IEC1000-3-2 in a 3 phase system are determined. By means of the Infratek operating software, simple pass-fail criteria are generated.